Using a handy network feature built into OS X and supported by most modern Macs, you can remotely wake a Mac from sleep using an iPhone (or iPod touch, iPad, and Android too). This is done using something called Wake On LAN (WOL), and it’s easy to set up in Mac OS X and use from a smartphone with the help of a free app. The result is basically the total opposite of the remote sleep tricks we’ve covered before, and instead of remotely sleeping a machine, you can remotely wake it instead, having the Mac ready for general network access or just quicker use. Let’s go over how to set this up. 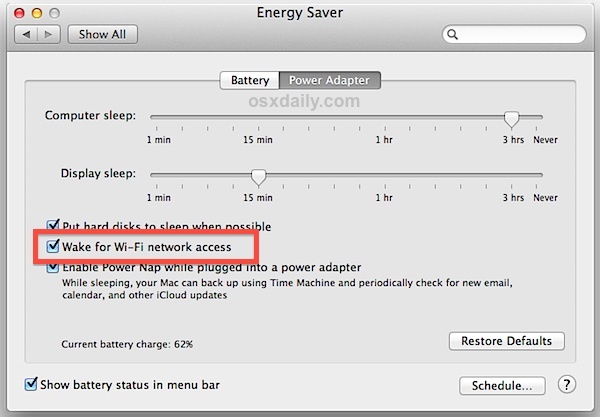 If you don’t see the “Wake for network access” option in the Energy Saver control panel, the Mac probably does not support the feature. It is also possible to get the Mac’s IP address from the Sharing control panel or command line, you will need this to match the ID of the Mac in question when you’re setting up WOL from iOS in a moment. You should be good to go now, so let’s test it out and make sure everything works. This is easiest to test if you have another machine or device that you can run ping from to detect the WOL Mac has been woken up by network access, but it’s not necessary. The reason being, using the WOL protocol to wake a Mac this way does not necessarily wake the devices display to the standard locked login screen which greets a Mac user if they were to hit a sleeping Macs spacebar. Instead, the display typically stays black, but the hardware is awake and active, able to receive network connections, pings, and whatever else you want to do with the machine. Now that it’s configured and confirmed to be working, you can remotely wake up the sleeping Mac using just the Fing app on the iPhone, so long as you are on the same wi-fi network. This is great for situations like upon arriving at home your Mac can be awake and waiting for you when you walk in the door, or for waking up a distant computer for an SSH connection, or for waking up your work computer when you step into the office door or, assuming wifi goes far enough, when you’re in the parking lot. You may want to run through the configuration process again too, making sure not to miss any steps. Can you use WOL from an Android Smartphone to wake a Mac or PC? Yes, Android phones can also wake Macs (or Windows PC’s) using the same Wake On LAN protocol, so if you don’t have an iPhone don’t sweat it. The initial OS X side setup is the same, but you must obviously use an Android app to wake the Mac and complete the second set of steps. The Fing app is actually available for free for Android users too, downloadable from the Google Play store, which would make the setup virtually identical to the steps outlined above, or you can use something called Mafro WakeOnLan, and it’s also free to use with a slightly different interface. And optional setting that is available through the NetStatus app allows you to use Wake On LAN through the broader internet, this means you don’t need to be on the same wi-fi network to get it to work beyond initial setup. That is done by configuring the routers IP address and an open port that forwards to the Mac with WOL support – again this is optional, and other free WOL apps may support the feature as well, but you would have to check yourself. Because this sometimes requires router configuration, it’s really beyond the scope of this article. I wonder if there’s a way to wake a remote Mac from the internet? Sometimes my Dad’s computer will not wake using Messages (even though it’s set up properly). An extra source of ‘kick in the pants’ might help! Yes you can remote wake a Mac over the internet with WOL, but you must have the port cleared on the router that the Mac resides behind. This article has a horrible title. I just read the entire article waiting for the “remote” part to come in. Its not remote unless you are not on the same wifi network, that would be called local. Paul, do you know where I can find instructions on how to do this? The article headline is 100% accurate, now, this part is crucial: only if you read the article and understand what you’re doing and how to comprehend what the article is about. Chris, are you familiar with what “LAN” stands for? LAN is an acronym for Local Area Network. The article tells you how to remotely wake a Mac using “Wake on LAN” (WOL), meaning you are using WOL to wake up the Mac away from the physical machine, you know, ‘remotely’. Now here’s where you are obviously confused and obviously didn’t read the article, though it says this specifically: yes you can use Wake On LAN outside of a LAN but you must have the individual machines IP address opened on the router port – that part varies per router. It will be different on my office Linksys vs a home Apple AirPort Express, etc. Some just have a simple ‘allow WOL’ button, most don’t. Connect to your router, poke around. But if you connect a Mac (or PC!) directly to the outside world, you already have the IP… and then… WOL wakes it up by IP. Everyones wi-fi router is different, you won’t find some universal instruction set on how to modify all routers to accomplish this. What a ridiculous comment. Anyway, I use this on a regular basis to wake my Mac when I get to the home or office, or if I need to perform remote management or want to trigger a Time Machine backup from far away. I understand this is advanced, so I am not surprised that an average computer user does not understand the limitations by default, and how to bypass those. Correct, you can open the port on a router for WOL support, but do note the feature in OS X is called “Wake for Wi-Fi Network Access” because most users will not know how to open a port and assign that port to the IP address so that the WOL command gets passed on to the proper Mac. You can connect to your router via web browser and try to determine if your router supports the feature, some do and some do not. It seems WOL will not work on laptops connected to WiFi via an Airport card. The newest Macs do support WOL over Wi-Fi, MacBook Air, Retina Pro, etc should do it. Probably iMac too. I’ve opened a port on my router…. and set up my server machine correctly…. because this works, when the computer has the user screen visible….. but when the MBP laptop, goes into ‘darkness’…. it doesn’t work. I have to go to the machine first…. tap the spacebar… and get the machine ‘awake’ before this works…. then I can log in…. Just to add – this does NOT work for MacBook after 2012. I have tried it with Maverick and Yosemite laptops (I have 4 of them) and even though I configured properly, it still doesn’t work. There are tons of this questions in multiple forums (Apple’s own included) and the answer – NO, it does not work. Still need to check if it’s supported on my macbook & imac. As for the “remote/internet” part, fing isn’t scanning the LAN if you are connected through VPN. It would be nice to get that worked. According to Apple’s article posted by Gary, it states that you will need an Airport Base Station on your network for this whole WAKE ON LAN thingy to work. The Airport based station runs a Bonjour Sleep Proxy service for the Mac to register itself for Wake On LAN. Question is, does the Mac need to be connected to this Airport Base Station or can the Airport just be a client on the LAN? I use my airport express set up to “Join a Network” and it is just a client connected wifi LAN for airplay streaming to my Hifi. I tried it, and my MacBook (iTunes Server) seems to be behaving as per Apple’s article. Sweet. Tried testing it again. Now the Mac won’t wake from sleep. So the Mac need to be connected to the Airport Express via wifi or do you just need the Airport to be on the same wifi LAN? Anyone knows? FYI, I’m using an Asus RT-AC68W as my main wifi router. Both my Mac and the Airport are on the same LAN, both join the wifi by the Asus, and both are clients. In case someone is wondering what port number to use, it is recommended to use UDP port 9 (and configure the router to forward it to your Mac).